Flat Earth Theory / Re: How does Round Earth Theory explain the Selenelion? I thought I already showed you how this is possible with refraction. It is the scientific explanation of a selenelion and the effects are consistent with refraction's laws. I don't see anything scientific about blaming this inexplicable event on an optical illusion. What scientific studies have demonstrated this mysterious illusion? Where are the mechanics of this illusion explained? I thought astronomical models could predict the setting and rising of the moon, stars, and sun down to the minute? Refraction is not considered in these spherical geometry models. It cannot be simultaneously true that astronomical models can accurately predict the positions of celestial bodies and that massive refraction occurs to bring celestial bodies from below the horizon and up into the sky. Which is true? What am I supposed to be looking for? I see a single paragraph on the subject which ends with an assertion that an optical illusion did it. And the other has the earth several times larger than the sun. So it looks like both images are invalid. The illustration I provided is from the observer's view, who is located at the point where the horizon line and the earth meet. The moon and sun take up approximately 0.5 degrees of the sky. The scene doesn't become any more possible in the illustration if we were to shrink the moon and sun to their appropriate sizes as seen from earth. Please show us how it is possible for the moon and sun to be in the sky simultaneously in such a scene. 1. The little man is over 1/4th the size of the earth's diameter, standing 2000 miles tall, and is able to see over the curvature of the earth to see the sun and moon simultaneously. any more valid that this? One image depicts a man who is 2000+ miles tall, looking around the curvature of the earth, and the other does not. Please tell me why you think that "this event" should be impossible under the RE model. No REer contends that, so you attack a straw man. "Outer" shadows of any object under the shine of a large light source are larger than the object, especially as distant from the object in the direction of illuminating light grows. So you are making up your story rather poorly. So... That's just not even a start of a concern. Except that the horizon is straight line as in my images. A man would need to be towering thousands of miles tall with his head into orbit to see around the curve of the earth to see an eclipse and the sun simultaneously. Your images neglect the horizon entirely. Please show me, in my images, how both the sun and moon could be above the horizon line, simultaneously. Observer is located where the horizon and earth meet. Tom Bishop: please note how when (in this case) refraction is invoked for us RE'rs, that refraction, as used here, does in fact work in a way that is consistent with the laws of refraction. 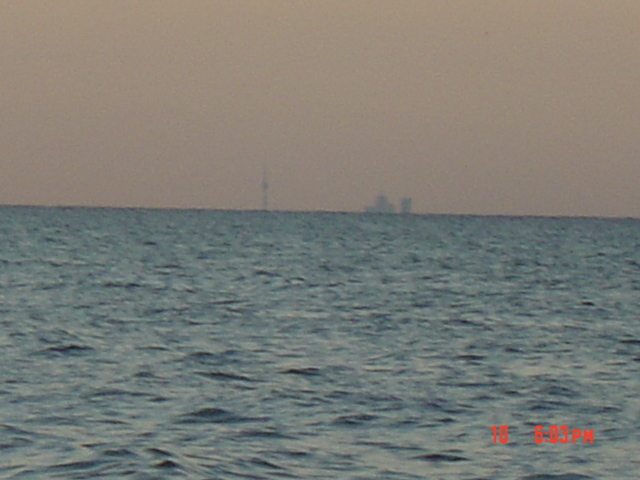 Even if there was some sort of extreme refraction in the atmosphere was the case, where the moon could be over 30 degrees above the horizon, that would mean that the position of all celestial bodies anywhere near the horizon is unpredictable in the Round Earth model using astronomical models based on spherical geometry, which do not take refraction into account. I keep hearing from you guys that we can predict moon set, moon rise, etc under those models as a proof of RET. Why is it that all mirages in the atmosphere are inconsistent and indistinct while this mirage is perfect and distinct for a long period of time? Have you ever seen a tree or a boat floating in the sky through a mirage? It is not distinct at all. In RET a Lunar Eclipse occurs when the moon, earth, and sun perfectly align to cast a shadow of the earth upon the moon. That would be a "total lunar eclipse" but there are "partial eclipses" too, where the earth only projects a shadow over a smaller zone of the Moon's surface. 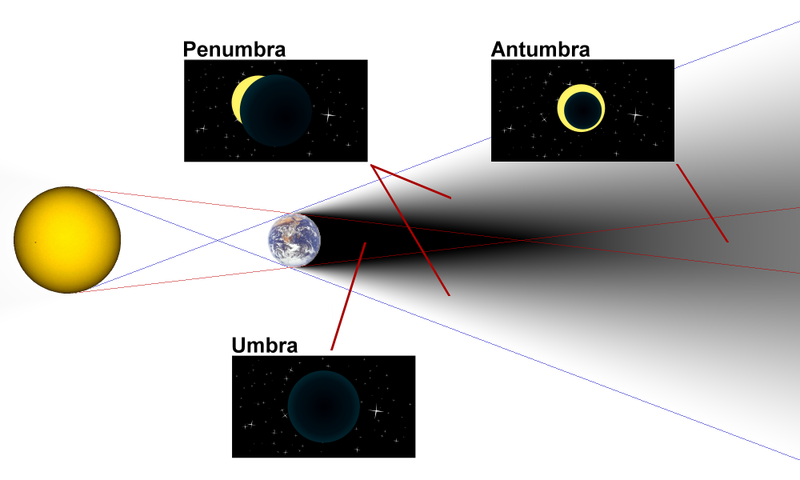 In addition, eclipses can be due to the object being in the umbra, penumbra or antumbra. Your diagram is terribly wrong, awful, fake, horrible and lacking any kind of trustable information. Stop posting data that is false or based on your missinformation, please. So I hope you understand now how a round planet can explain a selenehelion, while a flat planet model can't. 2. The sun is correctly lighting the moon from the top down in your image, as it peeks over the horizon. In the video the sun is lighting the moon from the bottom up as it rises. This remains unexplained. Except that we often provide evidence to back the allegations of fraud. Flat Earth Theory / Re: Shadow Object and empyrical demonstration against total eclypses. You have an error in your understanding of FET and the Shadow Object. A Lunar Eclipse occurs when the moon, shadow object, and sun perfectly align. The shadow object is rotating around the sun as a satellite and projects a shadow on the moon when all three object align. When we look at the moon we are seeing a shadow projected upon it. This is why the Lunar Eclipse can be seen by anyone who can see the moon in their sky. A Solar Eclipse occurs when the moon passes between the observer on earth and the sun, and is the reason why a Solar Eclipse can only be seen on narrow strips of land along the earth's surface and why it happens for different locations at different times during the day. Flat Earth Theory / How does Round Earth Theory explain the Selenelion? In RET a Lunar Eclipse occurs when the moon, earth, and sun perfectly align to cast a shadow of the earth upon the moon. However, there exists what are known as Selenelions, where both the moon and sun have been seen above the horizon during a Lunar Eclipse. Observations of seeing both the sun and moon in the sky during a Lunar Eclipse has been recorded as far back as Tycho Brahe. This event should be impossible under the Round Earth model. Take a look at this Selenelion, for example. The moon is in front of the camera, the sun is rising behind the camera, and the earth is below. Firstly, during a lunar eclipse the moon should be well below the horizon line when the sun is rising up from the horizon. This is an impossibility in the Round Earth model. Secondly, in the video the shadow of the earth is obscuring the moon from the top down rather than the bottom up, contrary to what would be expected when the earth is passing between the moon and sun. The sun's light should be peeking over the earth's horizon and hitting the moon from the top down. Are we to believe that "refraction" has not only placed the moon that far above the earth's surface, but has moved the shadow the wrong way to boot? I find the timing interesting. So soon before elections and immediately following his second in command's defeat to more extreme republicans. It takes a while for cases to move up through the courts. If he had done it in 2016 the suit wouldn't have much impact when Obama is no longer president. Under the Copernican model, an annual parallax is predicted. The fact that annual parallax is not observed forces astronomers to place the stars immeasurable distances away. What the Th*rk are you talking about, Tom? Annual parallax has been observed for well over 150 years. Annual parallax is normally measured by observing the position of a star at different times of the year as the Earth moves through its orbit. Measurement of annual parallax was the first reliable way to determine the distances to the closest stars. The first successful measurements of stellar parallax were made by Friedrich Bessel in 1838 for the star 61 Cygni using a heliometer. This is addressed in Earth Not a Globe and the last pdf I posted about terrestrial motion. These claims were not able to be replicated. Under the Copernican model, an annual parallax is predicted. The fact that annual parallax is not observed forces astronomers to place the stars immeasurable distances away. It is the only way to make sense of the Copernican model. There is no other evidence that the stars are extremely far away, except that anything otherwise would break their model. The evidence for a big universe is based on nothing more than "well, assuming that the Copernican model is true, that's the only way it could work -- so therefore the universe is immeasurably big and the stars are light years away." A major point of astronomy is based on a failure of the Copernican model to predict! Might I ask why you are ignoring redshift? Firstly, redshift does not indicate speed or relative distance. Secondly, no one has ever tested the hypothesis of stellar doppler shift to demonstrate that bodies at super luminal speeds, approaching or receding, will appear a certain color. Thirdly, some stars may simply be red or blue. The model given in the original description of the Bi-Polar model in the book "The Sea-Earth Globe and it's Monstrous Hypothetical Motions" did not illustrate the layout of the continents, but provided an illustration consisting of two circles with N and S points centered within it, and paths illustrating the motions of the sun. A continental layout was not provided. The continental layout you see there is a map projection which was found on the internet, which has 0 degrees East as the center point. No such layout claim is published in the literature. The map seen is for illustration purposes only. EXAMINATION OF THE SO-CALLED "PROOFS" OF THE EARTH'S ROTUNDITY.--WHY A SHIP'S HULL DISAPPEARS BEFORE THE MAST-HEAD. IT has already been proved that the astronomers of the Copernican school merely assumed the rotundity of the earth as a doctrine which enabled them to explain certain well-known phenomena. "What other explanation can be imagined except the sphericity of the earth?" is the language of Professor de Morgan, and it expresses the state of mind of all who hold that the earth is a globe. There is on their part an almost amusing innocence of the fact, than in seeking to explain phenomena by the assumption of rotundity, another assumption is necessarily involved, viz., that nothing else will explain the phenomena in question but the foregone and gratuitous conclusion to which they have committed themselves. To argue, for instance, that because the lower part of an outward-bound vessel disappears before the mast-head, the water must be round, is to assume that a round surface only can produce such an effect. But if it can be shown that a simple law of perspective in connection with a plane surface necessarily produces this appearance, the assumption of rotundity is not required, and all the misleading fallacies and confusion involved in or mixed up with it may be avoided. Read the Chapter Perspective on the Sea. As sea the effect is primarily due to the waves building up at the eye-level horizon. Now, direct them to the plane of some notable fixed star, a few seconds previous to its meridian time. Let an observer be stationed at each tube, as at A, B; and the moment the star appears in the tube A, T, let a loud knock or other signal be given, to be repeated by the observer at the tube B, T, when he first sees the same star. A distinct period of time will elapse between the signals given. The signals will follow each other in very rapid succession, but still, the time between is sufficient to show that the same star, S, is not visible at the same moment by two parallel lines of sight A, S, and B, C, when only one yard asunder. A slight inclination of the tube, B, C, towards the first tube A, S, would be required for the star, S, to be seen through both tubes at the same instant. Let the tubes remain in their position for six months; at the end of which time the same observation or experiment will produce the same results--the star, S, will be visible at the same meridian time, without the slightest alteration being required in the direction of the tubes: from which it is concluded that if the earth had moved one single yard in an orbit through space, there would at least be observed the slight inclination of the tube, B, C, which the difference in position of one yard had previously required. [paragraph continues] But as no such difference in the direction of the tube B, C, is required, the conclusion is unavoidable, that in six months a given meridian upon the earth's surface does not move a single yard, and therefore, that the earth has not the slightest degree of orbital motion. The consequences of scientific fraud vary based on the severity of the fraud, the level of notice it receives, and how long it goes undetected. For cases of fabricated evidence, the consequences can be wide-ranging, with others working to confirm (or refute) the false finding, or with research agendas being distorted to address the fraudulent evidence. When sitting in a rapidly-moving railway carriage, let a spring-gun 1 be fired forward, or in the direction in which the train is moving. Again, let the same gun be fired, but in the opposite direction; and it will be found that the ball or other projectile will always go farther in the first case than in the latter. If a person leaps backwards from a horse in full gallop, he cannot jump so great a distance as he can by jumping forward. Leaping from a moving sledge, coach, or other object, backwards or forwards, the same results are experienced. Many other practical cases could be cited to show that any body projected from another body in motion, does not exhibit the same behaviour as it does when projected from a body at rest. Nor are the results the same when projected in the same direction as that in which the body moves, as when projected in the opposite direction; because, in the former case, the projected body receives its momentum from the projectile force, plus that given to it by the moving body; and in the latter case, this momentum, minus that of the moving body. Hence it would be found that if the earth is a globe, and moving rapidly from west to east, a cannon fired in a due easterly direction would send a ball to a greater distance than it would if fired in a due westerly direction. But the most experienced artillerymen--many of whom have had great practice, both at home and abroad, in almost every latitude--have declared that no difference whatever is observable. Alas Robotham is again imprecise. Motion is relative. But let's try to get through the confusion. Let's work only with the cannon example. It the cannon were mounted to the Earth and fired east and then west, we could measure the distance each cannonball traveled from the breech. Based on other comments here, I believe the R. is again forgetting that the cannonball had momentum (of its mass time the Earth's velocity) before, during, and after the firing. The effect of the RE's spinning would be measures in inches for drop times over 5 seconds. Since R. doesn't document that experiment well, omitting muzzle velocities, aiming, droop times, we can't peer review this experiment. We don't know what outcomes he expects, to what degree of accuracy he has built into the experiment and which results indicate failure of RET. I can say that there are many high-school-level rifle firing that confirm the RE's rotation. Here's a good one: So. R. is wrong and RET is further confirmed. Wind travels East to West or West to East, so of course shooting from North to South would be more accurate than shooting East to West. I'm back, and I'll respond to a few points. Rapid does not mean 'accelerate.' For example: The car traveled at a constant speed of 100mph as it rapidly approached the cliff face. This sentence is not confusing because I described something as moving rapidly and constantly. Your quoted definition does not say that 'rapidly' refers to a constant pace. It says that it refers to something happening quickly in a short amount of time. Ie. accelerate. But let's assume for the moment that Rowbotham actually meant 'accelerate' instead of 'rapid.' He performed an experiment to prove that if one object accelerates away from another, that object will accelerate away from the other. Wow. Brilliant. What does that have to do with a round Earth? It has more to do with improper tarnishing of a work beyond your reading level. 1. Subliminal messaging: The people selected for this video are stereotypes who don't look like good drivers (women, the elderly) and Google makes them better drivers with the Google Car. 2. Production slip: How did the blind man at 2:37 see that he was passing those people to yell at them from the window? Incorrect. Had you bothered to click on the image you posted here from the site, it would have enlarged, showing that the image was not snapped on the equinox day. Your claim was that it is seen from the North Pole and South Pole for 24 hours. I don't see 24 hours in that photograph.